Grafton – Under the barrel-domed ceiling of the main room in the Grafton Public Library, a group of teenage boys play a loud, animated game of Dungeons and Dragons one Friday night a month, when the library is officially closed. On hand are two staff members, including Grafton’s teen librarian, Allison Cusher, 28, whose hair is currently purple. 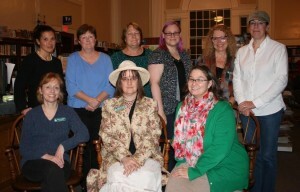 Cusher is part of a dynamic team of 14 women who have modernized the Grafton Public Library, and created a very happy, service-oriented atmosphere. Some long-term and some recently hired, the Grafton staff is committed to going the extra mile for library visitors. Patrons look forward to seeing Heidi Fowler, reference librarian since 2012, who often dresses in costume to match the season or a book. She recalled dressing in a Halloween costume for the book, “Hell for the Haunted,” and in tweed for, “Aunt Dimity and the Wishing Well.” Her costumes are elaborate and dramatic. Donna Bates-Tarrant has worked for the library for 15 years as a cataloguer and in technology services. A huge self-directed knitting group has taken hold at the library, under the guidance of Lee McCulloch, assistant librarian. McCulloch, who spent 20 years as a registered nurse, is relishing her second career. A multigenerational knitting group of 10 to 30 meets one Saturday afternoon a month, currently making hats and mittens for the Grafton Food Pantry. Fresh out of library school, Sarah Banister, children’s librarian, offers phenomenal programming, according to Gallaway. Marilyn Wilcox, an ordained minister, is another who has found a second career at the library, now working as a children’s room assistant. Gallaway said that Wilcox gets excited when children get their first library card. Circulation assistant Jan Parise volunteers as a docent at the Worcester Art Museum. Her knowledge of art and culture is big draw for the library, said Gallaway. Another innovative staff member is Susan Leto, head of circulation, who started a program called Book Wagon. Every week, she fills a Radio Flyer wagon with large print books and heads to the Grafton Senior Center. Using her laptop logged into the library’s network, she is able to remotely check out books. The program has been so successful that she now visits the Crescent Manor Rest Home as well. Thanks to Beth Patch, produce, herbs and flowers are grown on the library grounds, and given away at the circulation desk and to the local food pantry. Completing the staff are Val Evans, Eileen LeBlanc, Jennifer McNeil and Susan Witham. Gallaway invites visitors to explore the library. “We offer a unique blend of services, and if your concept of a library is ‘the place with all the books,’ you’ll be pleasantly surprised by discounted museum passes, home delivery service, ukuleles and even a telescope that you can try at home,” she said.